There are nine tunes by seven different well-known songwriters. More and more people are entering the world of sannyas, and they generally like Osho songs, but often cannot understand the words. Aneesha and Subodha have done a great job of singing the lyrics clearly, with authentic expression and with no discernible accent. Aneesha and Subodha chose works that they like to sing and harmonize on together. They, along with Subodha's band in Italy, made the recording in a few days. Here's a sampling of the titles: “Like Falling Leaves”, “Here With You”, and “This Precious Moment.” The album starts off with “Close to You,” which wholeheartedly introduces the rest of the songs. Aneesha’s and Subodha's voices along with Miten's songwriting create a strong devotional vibration. Ninad plays the keyboard, which is showcased in this first piece. “From the Smallest Grassleaf” has some of the best harmonizing on the album and is a wonderful reminder that everything in Existence is Buddha-nature and blissfulness. “Just One Look” is a favorite song of the people who participate in the Sufi dances that Aneesha leads from Russia to the Riccione Osho Festival in Italy. The music on “Endless Night” is not as melodic as it could be and the vocals could have been better, but Milarepa's lines are refreshing with his reference to “The New Man.” The arrangement on “Like Falling Leaves” is very good, and the instrumental portions of “Depth of My Being” have a really contemporary sound. It would have been helpful to have the lyrics be printed as part of the liner notes. Some of the songs are pure poetry. This offering with its new arrangements of beloved songs is a wonderful addition to the library of songs our Master inspired and that has been growing for decades. Every Osho center and anyone who wants to be wrapped in “Osho-space” should have a copy of this jewel. 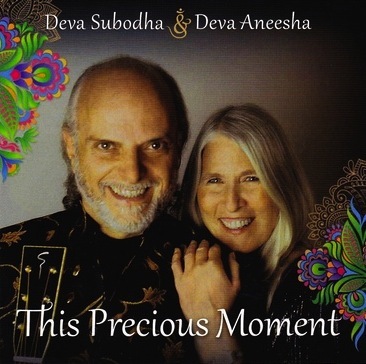 "I am enjoying this new CD "This Precious Moment" that I just recently received from Viha. I listen to it during the early morning hours when, most likely, I'm cleaning up my kitchen space. This morning, in particular, tears came to my eyes when taking into my Being, lyrics only another Sannyasin could appreciate in their intensity of meaning. Simply beautiful! I much appreciate having this."